THE Perak fiasco seems to continue unabated, and a long-drawn legal battle appears inevitable. - whether undated letters of resignation are valid. - whether the Election Commission has acted ultra vires (beyond its powers) when it decided not to call for by-elections in the seats of Behrang and Changkat Jering. - whether the Sultan of Perak has erred constitutionally by asking Datuk Seri Mohammad Nizar Jamaluddin to resign when no motion of no-confidence had been passed against the latter in the state assembly. On the first issue, Pakatan Rakyat will have to convince the court it should not follow the 1982 decision of the Federal Court in Datuk Ong Kee Hui v Sinyium Mutit, which held that such an arrangement is void and the court will not lend its aid to an illegal transaction as it is against public policy. In giving the judgment of the Federal Court, judge Tun Salleh Abas said: "The system of representative government is based upon freedom of choice. The electors must be free to choose a candidate to represent them in the legislature, whilst the candidate who is successfully returned must in turn be free to act in accordance with his independent judgment. Any arrangement depriving him of this independence is frowned upon by the law as violating public policy." The second issue revolves around Article 36(5) of the Perak Constitution which reads: "A casual vacancy shall be filled within 60 days from the date which it is established that there is a vacancy." The word "establish" connotes something has to be done to ascertain whether a casual vacancy has arisen. It is interesting to note that only two other state constitutions use the word "establish" -- Sabah and Sarawak. The others contain an almost identical provision stating that a casual vacancy is to be filled within 60 days on which it occurs. However, the Perak Constitution is silent as to who should "establish" there is a casual vacancy. But to say that it is not the business of the Election Commission to establish a casual vacancy has arisen may not be entirely correct. In fact, Article 21(5) of the Sarawak Constitution and Article 54(1) of the Federal Constitution expressly and respectively provide that casual vacancies in the Sarawak Assembly and Dewan Rakyat are to be established by the Election Commission. Article 113(1) of the Federal Constitution provides that the Election Commission shall, subject to the provisions of federal law, conduct elections. The federal law in question is the Elections Act 1958, and Section 12(3) of the act provides as follows: "In relation to a vacancy which is to be filled at a by-election, a writ shall be issued not earlier than four days and not later than 10 days from the date on which it is established by the Election Commission that there is a vacancy." It follows that for Pakatan Rakyat to succeed on this issue, it has to convince the court that, taking the Perak Constitution in totality, it is the speaker who establishes when a casual vacancy has occurred. 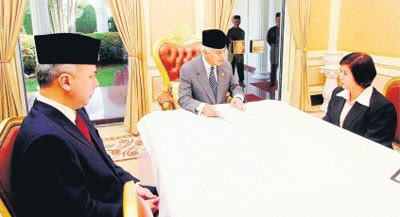 The third issue involves the interpretation of Article 16(6) of the Perak Constitution, which reads: "If the menteri besar ceases to command the confidence of the majority of the members of the Legislative Assembly, then, unless at his request His Royal Highness dissolves the Legislative Assembly, he shall tender the resignation of the State Executive Council." Of course, if the Sultan of Perak had decided to dissolve the state assembly based on the ground that the three independents -- Jamaluddin Mohd Radzi, Mohd Osman Mohd Jailu and Hee Yit Foong -- had vacated their seats, then that would also mean the sultan would have prejudged the issue by saying the EC is wrong by not calling for by-elections. The issue is how the sultan determines that the menteri besar ceases to command the confidence of the majority of the members of the legislative assembly if no vote is taken in the assembly against the menteri besar. It was decided as far back as in 1966 in the case of Stephen Kalong Ningkan v Tun Abang Haji Openg & Tawi Sli that the Sarawak governor only had the power to dismiss the chief minister if the lack of confidence had been demonstrated by a vote in the Council Negri. However, the Kota Kinabalu High Court did not follow the 1966 decision in Datuk Amir Kahar Tun Mustapha v Tun Mohd Said Keruak & Ors 1995. The court held that a vote in the assembly is not the only means to determine the confidence of the members of the assembly in the chief minister and it depends on the circumstances. The court added that other extraneous matters may provide sufficient evidence to establish the fact that the chief minister has ceased to command the confidence of a majority of the members of the state assembly. The court further held that the 1966 case must be distinguished, being a decision based on its own facts and circumstances, because the alleged loss of confidence was highly suspect. Here, the Sultan of Perak went one step further by sitting down with each of the three independents to satisfy himself that all three of them no longer supported Nizar and, therefore, the Pakatan Rakyat government. The alleged loss of confidence was convincing enough for the sultan to decide that Nizar should resign in accordance with Article 16(6) of the Constitution. Hence, Pakatan Rakyat will have to convince the court that sovereign discretion is justisiable, and that without a vote in the assembly, the sultan could not ask Nizar to resign. Whatever it is, the events in Perak have convinced me even more that we should have anti-hopping legislation. As I said in an earlier article, "Anti-hopping law vital for stability", on June 22 last year, politicians from all divides should very well remember that what goes around will come around to haunt them.